Coachman has always injected character into its caravans. For the Pastiche range that character is its homely modernity, sitting pretty on the fence between the traditional and the contemporary in interior-design terms. The exterior’s cool grey clean-lined graphics distinguish the Pastiche, together with a quadruple banding of recessed lines running the length of the caravan at window height. Inside the caravan you’ll see nearside double bed with offside shower/washroom, centre offside kitchen and front parallel settees with centre front drawer unit. 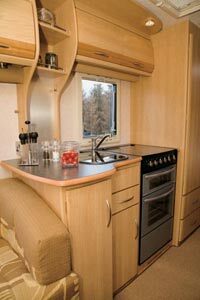 One of its best features is an enormous multi-use work surface, right where you need it – in the centre of the caravan and opposite the kitchen. It could comfortably sit your television and there’s still ample space for you to use this surface as an auxiliary kitchen area. Ideal for when you’re entertaining friends and need, perhaps, a bar area. It’s ideally suited for croissants and coffee in the morning. The kitchen itself is not small. The food preparation area to the left of the sink would be quite adequate if you’re catering for two. When you’re feeding four, though, you’d use both work surfaces – and that’s when you’d really appreciate this design. Cooking equipment is a Spinflo Caprice Mark III unit with four gas burners, grill and oven, plus a microwave – but, unusually, the microwave is not built in; you have to take it out from its head-height in-use position every time you tow and a notice reminds you to do so. The luxurious bedroom features a double bed with minimal corner cut-off, and en suite shower and toilet room. And the shower arrangement is just superb – a complete door shelters the loo from shower splashes – and the shower is large. The only slight doubt we have about its universal appeal is that you have to walk through the shower to get to the loo, which means you have to wipe-dry the shower tray after each use. The washbasin and ample mirror are forward of the shower room – and the bedroom divides from the living area by means of a concertina door plus a blind that drops through the part-wall beside the nearside working surface/television area. Among this caravan’s many plus points is its door window. It’s especially long, so you get plenty of light flooding into the central area of the layout. Come evening delightfully neat little spotlights with spectrum shades perch on each side of the bed and there are plenty of spotlights in the living area. The Pastiche 535/4 is essential viewing if you’re looking for a new caravan with an end bed, side shower layout. Striking a balance between the traditional and the contemporary, it offers affordable luxury. *Caravan insurance cost based on £16,290 sums insured (Caravan plus £1000 equipment) on a market value basis. Caravan kept at BD20 on driveway with drivepost and fitted with hitchlock, wheelclamp and alarm as well as AL-KO ATC. Caravanner over 30 years of age with 3 years claim free caravanning and a magazine subscriber. Premium is inclusive of Insurance Premium Tax at 5% and is correct on 13/06/08.